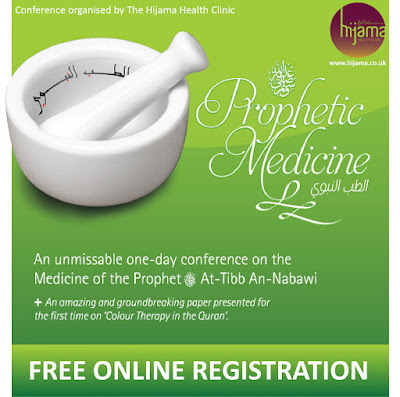 An Unmissable one-day conference on the Medicine of the Prophet (SAW) At-Tibb An-Nabawi! At a time when alternative medicine in the West has been growing, Western medicine questioned for its universality and the demand for effective health care remedies rises, a great opportunity has come for us to learn about the theory and application of medicine of the Prophet (sws), as taught to us by the Prophet (sws) himself. They deal with the treatment and cures for common and complex health disorders and restoration of health of heart/mind (qalb/aql), soul (ruh) and body (badan). For the first time in the UK, this programme will be delivered by an internationally acclaimed professor, researcher and a widely respected speaker on Islamic Medicine, Physical Therapy and Complementary Medicine, Dr. Amir Saleh. • What are the Prophetic foods and herbs and their nutritional benefits in the prevention and cure of disease? • What are the medical and health benefits of Tahara, Wudu and Salah? benefits in the prevention and cure of disease? • What is Spiritual Healing and what conditions is it considered for? • What is Ar-Ruqyah Ash-Shariah (Qur’anic Healing Therapy)? evil eye on our health and how do we protect ourselves from them? • An amazing and groundbreaking research will also be presented for the first time on ‘Colour Therapy in the Quran’. Our thanks to Hijama Health Clinic from London, England for sharing the above post. If you have any questions or want to leave some feedback for them, then please do so via a comment* below. I am Hijama therapist in Pondicherry, India. I am very much interested in attending this conference but due to geographical constraints I cannot. Can I get the recorded session of this somewhere after this event? Can anyone please help me to get it? Wa alaikom assalaam wa rahmato Allah! Thank you for your efforts in continuing to work to educate others about the blessed benefits of partaking in prophetic medicine. I live in the states and would also truly appreciate if you could arrange any recordings and then post them online. Anyone attended the conference, can you please share the audios via my mail?